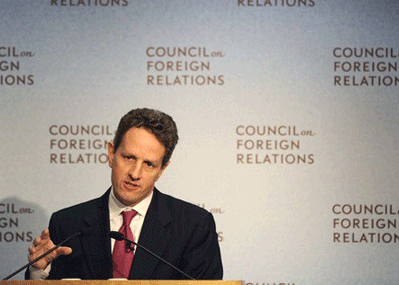 Treasury Secretary Timothy Geithner was head of the Federal Reserve Bank of New York and is a member of the Council on Foreign Relations and the Trilateral Commission. …who intentionally caused the latest financial problems. Oct. 14 (Bloomberg) — Some of Treasury Secretary Timothy Geithner’s closest aides, none of whom faced Senate confirmation, earned millions of dollars a year working for Goldman Sachs Group Inc., Citigroup Inc. and other Wall Street firms, according to financial disclosure forms. As part of Geithner’s kitchen cabinet, Sperling and Sachs wield influence behind the scenes at the Treasury Department, where they help oversee the $700 billion banking rescue and craft executive pay rules and the revamp of financial regulations. Yet they haven’t faced the public scrutiny given to Senate-confirmed appointees, nor are they compelled to testify in Congress to defend or explain the Treasury’s policies. While it isn’t unusual for Treasury officials to come from the financial industry, President Barack Obama has been critical of Wall Street, blaming its high-risk, high-pay culture for helping cause the financial-market meltdown. Sperling and Sachs are each paid $162,900 at the Treasury. Along with four others, they hold the title of counselor to Geithner. Sachs, 46, withdrew earlier this year from consideration to be the Treasury’s top domestic finance official, a job that would have required Senate confirmation. Geithner’s predecessor, Henry Paulson, brought on a coterie of non-confirmed advisers from Goldman Sachs at the end of his term. Paulson, who had been the firm’s chief executive officer, defended the arrangement as necessary to quickly bring in top talent when the financial system was on the verge of collapse. The title of counselor had been generally reserved for those awaiting confirmation. Some of Geithner’s aides now work in that capacity, including Lael Brainard, who has been nominated to be undersecretary for international affairs, and Jeffrey Goldstein, the nominee to be undersecretary for domestic finance. The use of unconfirmed counselors can cut both ways. It allows Geithner to bring in staff quickly by avoiding the arduous confirmation process. On the other hand, the aides don’t get as tough a vetting by the White House or Congress and remain less accountable than Senate-confirmed officials. Treasury spokesman Andrew Williams said the department needs people with a deep understanding of markets and the financial system, especially as it works to fend off the worst recession in half a century. “The secretary thought that the best way to utilize their talents was to allow these individuals to provide advice to the secretary on policy issues through appointments as counselor,” Williams said. All of Geithner’s counselors are subject to federal ethics rules, including a pledge to avoid contact with their former firms for at least a year, Williams added. Most officials at the Treasury who have been approved by Congress come from academic, legal or non-Wall Street backgrounds. For example, Geithner’s deputy, Neal Wolin, was president and chief operating officer for property and casualty operations at insurer Hartford Financial Services Group Inc. in Hartford, Connecticut. Michael Barr, the assistant secretary for financial institutions, was a professor at the University of Michigan Law School. An exception is Herb Allison, who runs the office that administers the financial rescue. He had been chief executive officer of mortgage finance company Fannie Mae and retirement- services firm TIAA-CREF, and before that was a longtime executive at Merrill Lynch & Co. in New York. Along with Sperling and Sachs, Geithner’s inner circle also includes counselor Lewis Alexander, the former chief economist at Citigroup; Chief of Staff Mark Patterson, who was a lobbyist at Goldman Sachs, and Matthew Kabaker, a deputy assistant secretary who worked at private equity firm Blackstone Group LP. Patterson’s and Kabaker’s jobs did not require confirmation. One counselor who doesn’t have a finance background is Jake Siewert, a press secretary for President Bill Clinton who came to the Treasury after working as a vice president at New York- based Alcoa Inc., the largest U.S. aluminum producer. Alexander, who left Citigroup in March to join the Treasury, was paid $2.4 million in 2008 and the first few months of 2009, according to his financial-disclosure form. He advises Geithner on economic trends and does research on financial markets. Kabaker, who works on domestic finance policy and helped craft the Treasury plan to spur banks to sell their toxic assets, earned $5.8 million working on private equity deals at Blackstone in 2008 and 2009 before joining the Treasury at the end of January, his disclosure form shows. Much of the compensation was in stock that Kabaker, who worked at Blackstone for 10 years, was awarded when it went public in 2007. Sachs’s former firm also had agreed to repurchase his shares in Mariner Partners Inc., an investment fund. Sachs estimated his income from the fund at $1 million to $5 million. Sachs, who declined to comment, also specializes in domestic finance. In Sperling’s primary job, he was paid $116,653 by the Council on Foreign Relations for work related to education in developing countries. Sperling’s disclosure shows he supplemented his salary through a variety of consulting jobs, board seats, speaking fees and fellowships, to bring his total income to more than $2.2 million in the 13 months ending in January. He was paid $480,051 as a director of the Philadelphia Stock Exchange and $250,000 for providing quarterly economic briefings to two hedge fund firms, Brevan Howard Asset Management LLP and Sterling Stamos Capital Management. Sperling spoke at a Washington event hosted by the Houston- based Stanford Group Co. in November 2008, three months before its chairman was sued by the Securities and Exchange Commission for allegedly bilking investors of $7 billion. He also spoke at a Washington event in October 2007 that was sponsored by Citigroup, which has received $45 billion in government assistance. Sperling, 50, was paid for his speeches through the Harry Walker Agency, which books speakers. His disclosure form does not list how much he was paid for each speech. Sperling also drew a $137,500 salary from Bloomberg News for writing a monthly column and appearing on television, according to his disclosure. Goldman Sachs paid Sperling the $887,727 for advice on its charitable giving. That made the bank his highest-paying employer. Even Geithner’s chief of staff Patterson, who was a full-time lobbyist at the firm, did not make as much as Sperling did on a part-time basis. Patterson reported earning $637,492 from Goldman Sachs last year. “My sole work for Goldman Sachs was as lead consultant on the creation, design, and initial implementation of ‘10,000 Women,’ their $100 million philanthropic effort to give business and leadership education to poor women around the world,” Sperling said. His total income of $2.2 million was unusually high, Sperling added. To contact the reporter on this story: Robert Schmidt in Washington at rschmidt5@bloomberg.net.